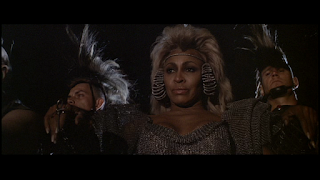 The third film in the Mad Max franchise, following Mad Max and The Road Warrior, Mad Max Beyond Thunderdome is a film that was compromised by tragedy. While scouting locations for the production, producer Byron Kennedy, who had been working with Max's creator George Miller for over a decade at that point, was killed in a helicopter accident. Miller considered abandoning the project after that, but then decided to push through and complete it in honor of his friend. He did take a step back, however, choosing to only direct the action sequences while handing the rest of the scenes over to television director George Ogilvie - giving Ogilvie his feature directorial debut. 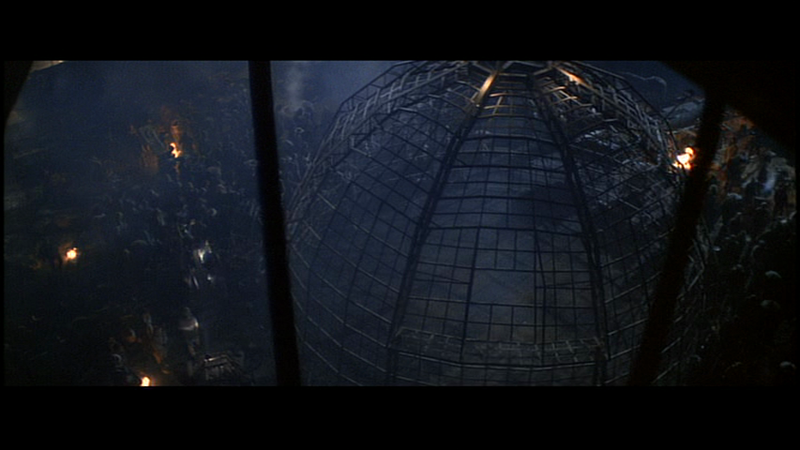 Miller has said that he doesn't remember doing the work on Thunderdome, as he was shooting it while in mourning. Even before that shocking event, this was already set to be an odd film. 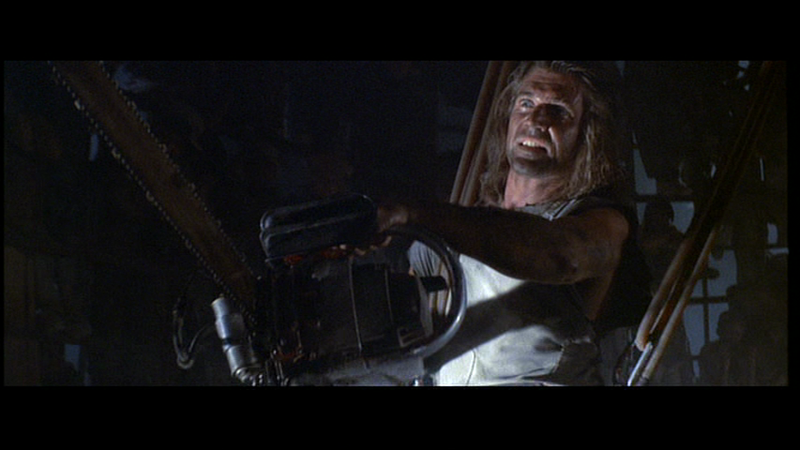 Miller's initial idea was to make a post-apocalyptic Lord of the Flies sort of story, and that idea was then developed into a Mad Max sequel. 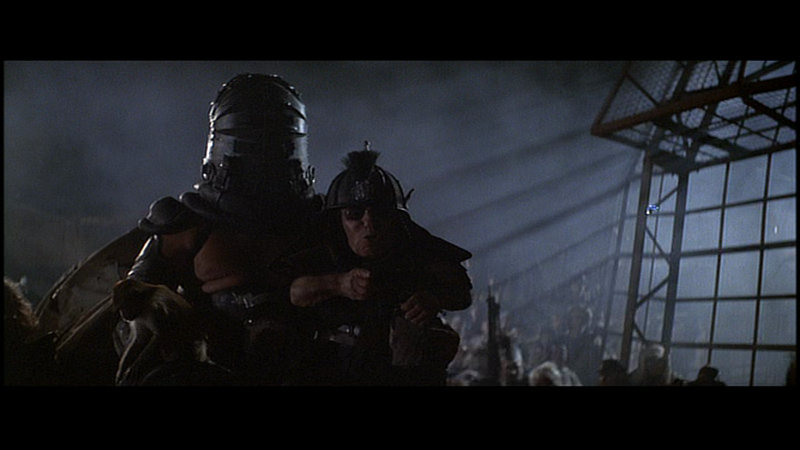 A weird, PG-13 version of a Mad Max sequel. The strangeness begins right up front. When we catch up with Max Rockatansky (played by Mel Gibson for the third and final time) some time after the ending of The Road Warrior, he's sporting some long hair and is being pulled across the Australian Outback by a line of camels... and he's being attacked by a small airplane piloted by a man named Jedediah, played by Bruce Spence. Although Spence played a pilot character of a different sort in Road Warrior, The Gyro Captain, the Captain and Jedediah are apparently two different characters. Kind of confusing, and there is debate about that among fans. 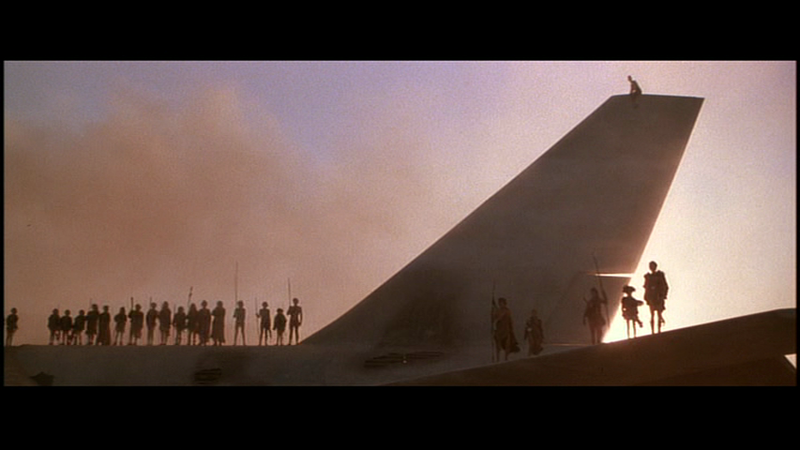 With the help of his young son, Jedediah steals Max's mode of transportation, stranding him in the desert. Forcing him to walk to a nearby place called Bartertown. It's within Bartertown that viewers are introduced to everything that is truly memorable about this sequel for the general audience. It's while Max is making his way around this quirky place that the clanging metal and saxophone score by Maurice Jarre really kicks in. That's where the more comedic tone of the film begins to make itself known. The town's inhabitants are the ones that stick with you - Bartertown founder Aunty Entity, who has a hell of a fashion sense and is played by musical icon Tina Turner. 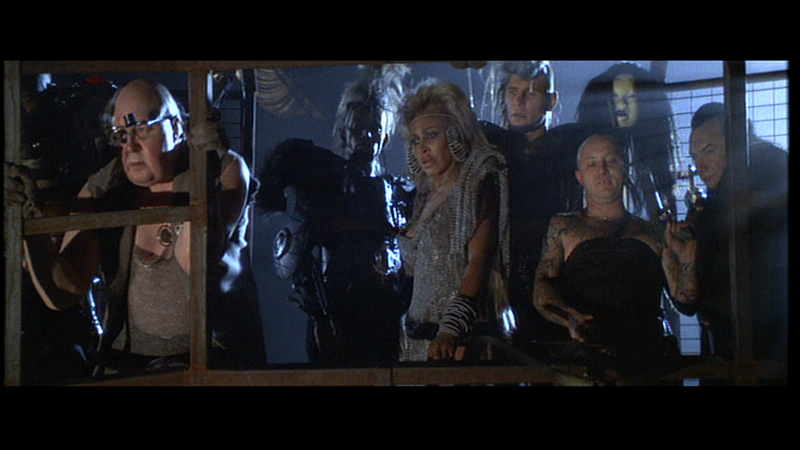 Angry Anderson as a character called Ironbar, who has a female mannequin face on a bar that runs up his back. Perhaps most notably, Angelo Rossitto as Master and Paul Larsson as the mask-wearing Blaster. 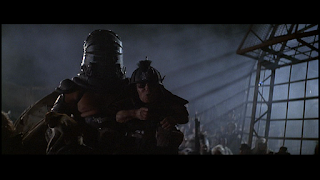 Together they are Master Blaster - Blaster is the mute, mentally challenged muscle who carries Master, a 2'11" dwarf, on his back. Master runs the Underworld, where the methane that powers Bartertown is processed - and thus, he believes that Master Blaster runs Bartertown. Aunty Entity disagrees. Aunty Entity disagrees with Master Blaster so intensely that she's looking for someone to kill Blaster, and for this job she chooses the stranger who has just walked into her town. Max. 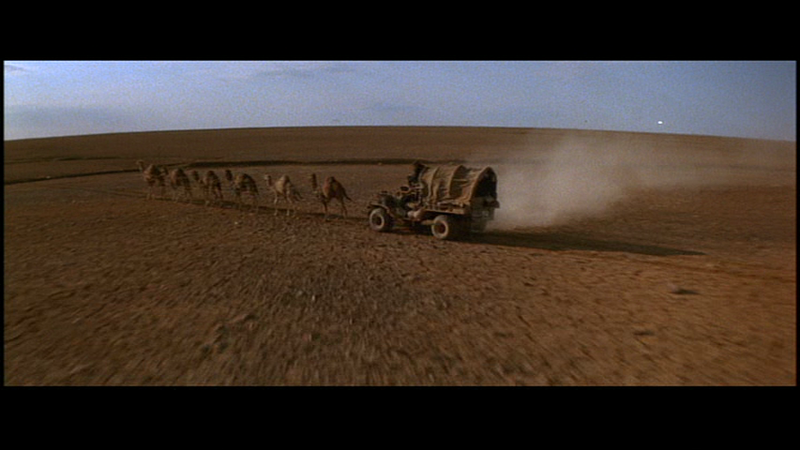 If Max succeeds, she will give him back his vehicle and camels, which were traded in Bartertown. 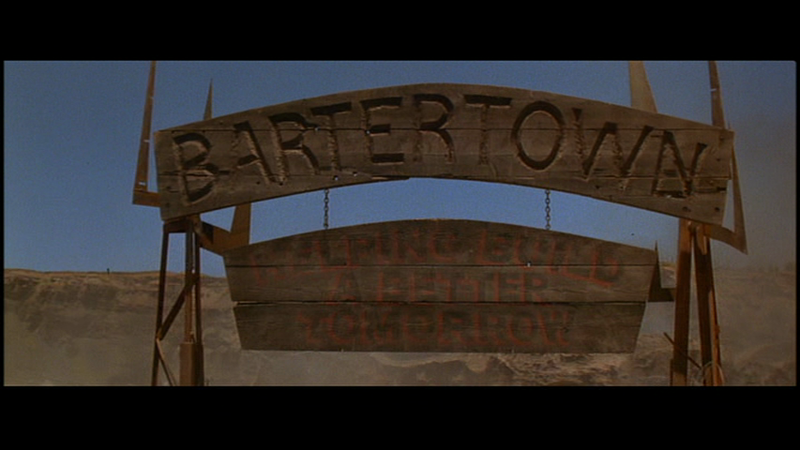 Being an anti-hero, Max goes along with the assassination plot, and he does it by the Bartertown book. He picks a fight with Master Blaster that will be fought in the official venue of Thunderdome, a metal dome where disputes are settled with a public fight to the death. "Two men enter, one man leaves." The fight is really the highlight of the film for me; these two men battling it out while the bloodthirsty crowd cheers on the violence. Both of them strapped to bungee cords, bouncing around inside the dome, going for the weapons that have been placed on the sides. Max outmatched by his hulking brute of an opponent, trying to keep from being beaten to death. 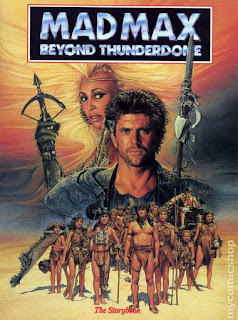 Unfortunately, this film isn't simply "Mad Max Enters Thunderdome", we have to follow him "Beyond" the Thunderdome fight as well, and that's where the story scripted by Miller and Road Warrior co-writer Terry Hayes loses me. 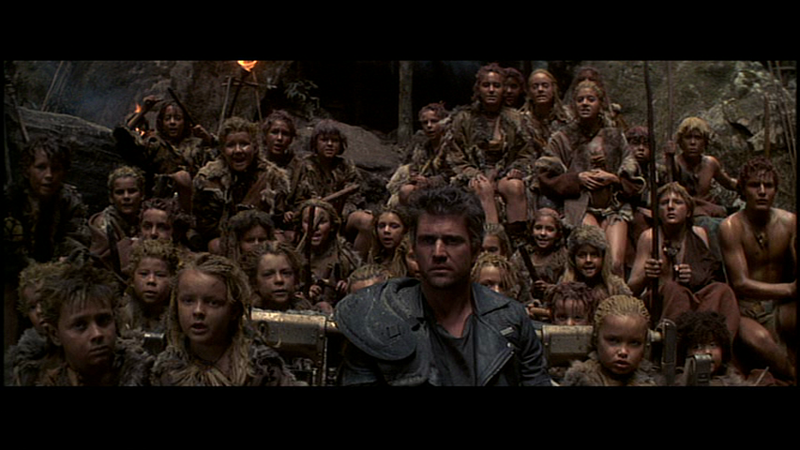 When it gets to the original idea of a Lord of the Flies-esque tribe of children, I check out. Max crosses paths with those children because he flakes out on his deal with Aunty Entity, growing a conscience when he sees the unmasked Blaster's face. In Bartertown, if you bust a deal you face the wheel; a spinning wheel with punishments listed on it, a sort of wheel of misfortune. 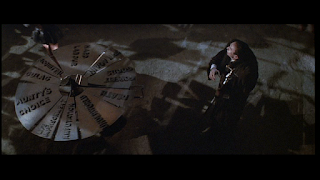 With a spin of the wheel, Max faces the possibility of Life Imprisonment, Amputation, working in the Underworld, Death, Forfeit Goods, Hard Labour, Acquittal, Gulag, or Aunty's Choice. The wheel lands on Gulag. A tied-up Max is placed on the back of a horse and sent off into the desert to die. Instead, he's taken in by a group of sixty children, their ages ranging between twenty months to sixteen years old. They are the survivors of an airplane crash, stranded in the desert, dreaming of heading off to a wonderful place called Tomorrow-morrow Land. And they believe that Max is the mythological figure who will lead them there. 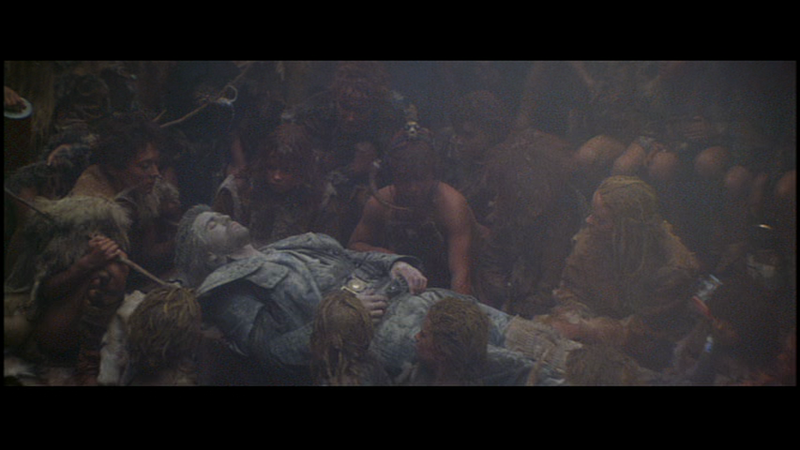 I find these kids to be a drag, and there's an hour left of the film's 107 minute running time when they show up. I have issues with the first 46 minutes of Beyond Thunderdome, but at least it's fun and packed with memorable characters and scenarios. These Tomorrow-morrow Land kids just run the film into the ground for me, I have no interest in their wild child antics, the unique version of English that they speak, or the mythology they have created for themselves. 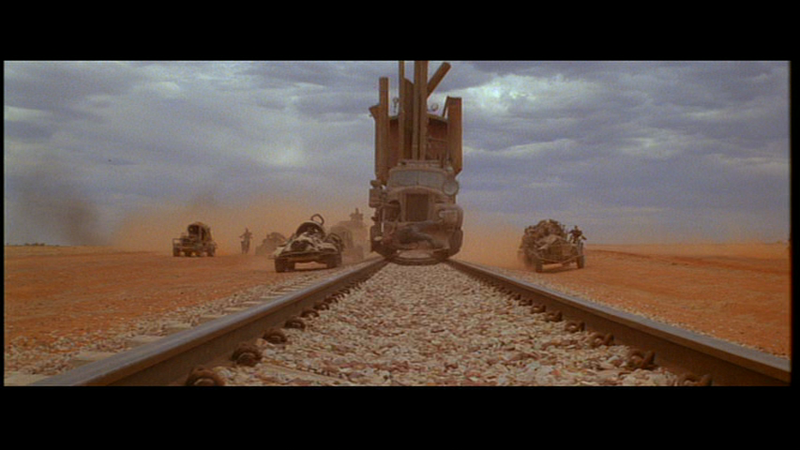 Thankfully, circumstances do eventually require Max and these children to cross the desert back to Bartertown, and in the climax of the film we finally get one of the main things we expect to see in a Mad Max movie: vehicular mayhem. It doesn't have a patch on the vehicular action in other Mad Max films, but beyond Thunderdome and beyond the kid stuff there is still a fun extended chase and crash sequence in here. And then to cap it all off, we have an awesome Tina Turner song, "We Don't Need Another Hero", playing over the end credits. Mad Max Beyond Thunderdome is a bit of a disappointment, but I can't write it off completely because I grew up on this movie, I watched it many times with various family members, and there are elements of it that are deeply ingrained in my mind. As much as there are things in it that I don't care for, there are also things that I love and will never forget. For all its unique weirdness, I appreciate it.